The Phizzing Tub...: Free Krispy Kreme Doughnut - TODAY! 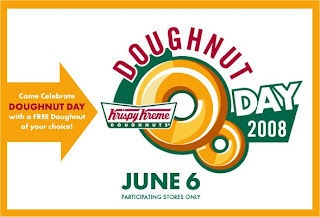 To celebrate today, participating Krispy Kreme doughnut stores will be giving away a free doughnut of your choice. If you would like to read more about the give away, check out the Krispy Kreme site.